Carolina became the 11th team to use its franchise tag today, opting to slap the tag on center Ryan Kalil, a 2007 second round pick. That means that the Panthers could end up losing DE Charles Johnson (2007 third round pick out of Georgia) and RB DeAngelo Williams (2006 first round pick out of Memphis and the all-time franchise rushing leader). Johnson had a fantastic season in 2010, starting all 16 games for the team and collecting 11.5 sacks in a contract year, and he's just 24 years old. You seldom see players with that kind of production and youth hit the open market. 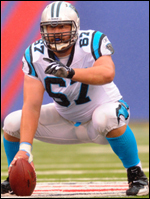 Kalil started all 16 games at center for Carolina for the past two seasons (and started 12 games in 2008), while Johnson had a breakout year in 2010 after having only four career starts prior to this past season. All indications out of Charlotte are that the Panthers would like to sign Johnson to a new deal, though they have to do so by the end of business on March 3 or else have to wait for the NFL and NFLPA to agree to a new CBA. Looking toward the draft, the NFL combine is slated to begin this Thursday in Indianapolis. And, with just two days to go, we're beginning to learn the plans of some of the big names relative to their plans for the event. The big news came yesterday from Cam Newton's camp, which let it be known that the 2010 Heisman Trophy winner plans to fully participate in the combine. That goes in contract to the other top QB prospect, Blaine Gabbert of Missouri, who does not plan to throw in Indy. It's actually rather unusual for an elite prospect to work out at the combine, though Cam Newton is clearly doing his best to overcome any negative perceptions that are out there about him. Don't take this as a sign of weakness for Gabbert; he likely will put on a full show at Missouri's pro day. Also, it's important to remember that while the combine has its share of standouts and disappointments every year with the measurable stats, the intangable sit-down interviews with players also is a very important part of the process. Teams that are on the fence can be swayed one way or the other on any given guy depending on how the interview goes. Interestingly, there are prop bets on the combine available for those who think they can beat a double vig (-120). My advice is to keep your money in your bank account, but there are some lines that I think are pretty strong. As much as I'm down on Jake Locker and don't believe he should be a first-round pick, him as a -150 pick vs. Christian Ponder in the 40 yard dash (the listing as of this writing) seems like a no-brainer to me. Keep in mind that, typically, if it sounds to good to be true, it is. But I still like Locker's chances to best Ponder. It's not something as severe as Locker vs. Ryan Mallett, but for as good of an athlete as Ponder is, he pales in comparison with Locker in the running speed department according to all indications. On Thursday the first three groups begin their combine experience: place kickers, specialists, offensive linemen, and tight ends. This is an unusual year for the offensive tackle position, with no clear-cut standout and the opportunity for any number of players to make a strong impression. Top tight end Kyle Rudolph won't be taking part in the event, as he is still recovering from the surgery he had to repair his right hamstring, which literally tore off the bone in early October. He plans to work out at Notre Dame's pro day on April 7, where he says he will run the 40 yard dash and take part in the standard 225 pound bench press event.